Marking the eastern entrance of the Fox Islands Thorofare in Penobscot Bay, a short distance away from the northeast end of the island of Vinalhaven. 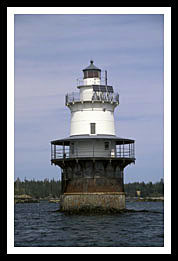 Goose Rocks lighthouse, known as a spark plug type lighthouse was built at the entrance to the Fox Islands Thoroughfare, which became a busy waterway for shipping traffic and mariners between Vinalhaven Island and North Haven Island. Myrick Morrison from North Haven, was Keeper at the light from 1920 to 1938, and had more than his fair share of family tragedies. His wife Eva died in 1928, Harold, the youngest son, died in the sinking of a Japanese prison ship in WWII, and another son, Norman, drowned in a fishing accident. The light was automated in 1963. After automation, some of the locals were employed for a number of years to control the fog signal at the lighthouse and were called "lamplighters". Vinalhaven Island lies about 15 miles from the mainland and is the largest of the year round islands in Maine, with overnight accommodations for visitors. For those that want to experience a simple existence of peaceful solitude just as the lighthouse keepers did in the past. Goose Rocks can accommodate up to six guests (two bedrooms and one bunkroom) for an all-day or overnight visit with a minimum contribution towards its ongoing maintenance and restoration efforts. Access to Goose Rocks includes real risks, and a safe and enjoyable visit is always dependent on guests' physical and mental ability to climb a vertical ladder (from a boat) to the catwalk for initial access, as keepers did many years ago. Visitors are responsible for their own food and provisions. Pick up is at the North Haven Town Dock (right next to the ferry docking station at the terminal) at a pre-set time. Contact the Beacon Preservation Inc. below for more info. Boat cruises and ferries mentioned below may offer many types of cruises. While some may offer specific lighthouse cruises that may pass by Goose Rocks Light, some may offer narrated wildlife and historic tours, and ferrying passengers. 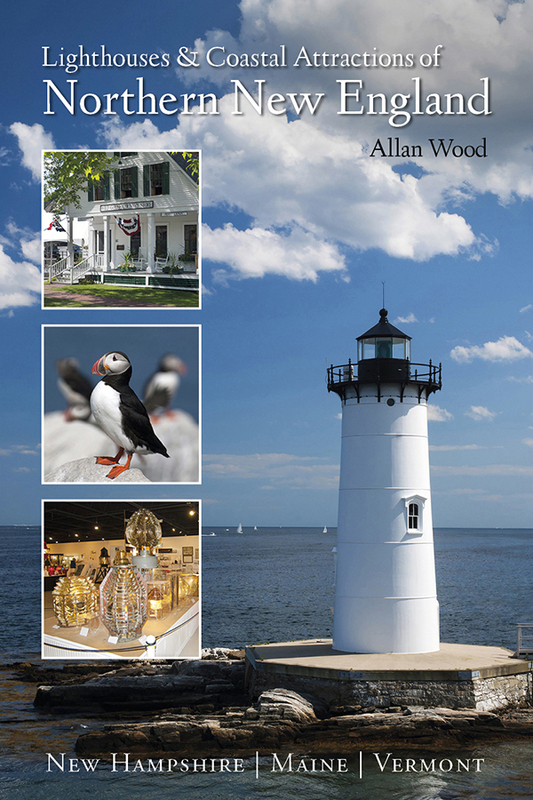 My 300-page book (with over 360 images), Lighthouses and Coastal Attractions of Northern New England: New Hampshire, Maine, and Vermont, provides human interest stories from each of the 76 lighthouses in these northern states, along with plenty of coastal attractions and tours near each beacon, and contact info to plan your special vacation. You'll also find information to stay overnight in certain lighthouses.